I spent some time this evening trying to find accommodations for our first few days in New Zealand. I decided to see what CouchSurfing offered first, then check out hostels as a backup plan. Before I get into the results, a bit of background on CouchSurfing is in order. 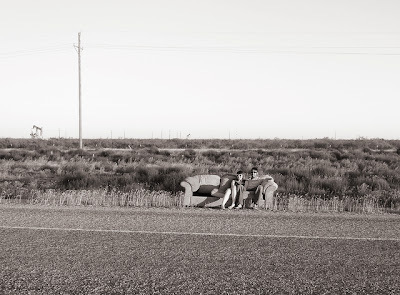 Sam & I once found a couch on the side of the road in Texas. I have been CouchSurfing since I watched a movie about house swapping and wondered if there was something like it for people who don't own houses. Months later, I was in Edinburgh, Scotland enjoying my first taste of CouchSurfing. 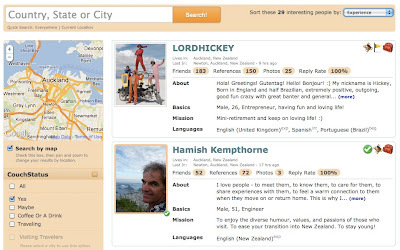 The basic concept of CouchSurfing is to exchange hospitality. Not only is it free, but it's a great way to meet others while traveling and have a local's experience, rather than what you might find in a travel brochure or from the window of your hotel. I've heard all the questions ("Is it safe? ", "Aren't you scared? ", "What if your host turns out to be crazy?") that come up in the minds of people who have grown up being told not to talk to strangers. I try my best to assuage the fears of the uninitiated, but there are some people who prefer to stay wary, thank-you-very-much! The first thing I bring up are the security measures. CouchSurfing allows its users to verify their identity & location, leave & view references for other members, vouch for others, and create a profile. The second thing I mention are my personal & entirely positive experiences. Sure, some of the people I've met I will never see again. Some might never be lasting friends, only friendly & polite overnight guests. On the other hand, I've connected with some great people from CS. There's Dory, whom I hosted for three days when I was very sick. We stayed in, dog-sitting for my parents, and talked, laughed and ate homemade cookies like two old friends. There are loads of others whom I've kept in touch with since they left. And of course there's Sam, whose last minute couch request eventually led to our marriage, and now our belated honeymoon in New Zealand. That story is so good it'll get its own post here someday. CouchSurfing doesn't have to be scary. Do your research. If you're not sure where to start, CS has all sorts of resources on the site, such as how to start hosting, tips on traveling alone, CouchSurfing for families, and more. You can also ask me! I didn't mean for this post to become an advertisement for CS, but I have had so many positive experiences through the site that I had to put it all in writing. Back to my search. After performing a "CouchSearch" for Auckland, I used the keyword "room" to narrow down my results to those offering a guest room, rather than a shared space. This is my first time surfing as a couple, so I narrowed my results to those willing to host 2 people at once. Results can be narrowed down with a variety of options, even more than shown here. I found quite a few to start, some close to the city center, some who offer to pick up new arrivals at the airport, some with bikes to lend and even one professional chef who offers tours to his guests on his afternoons off. 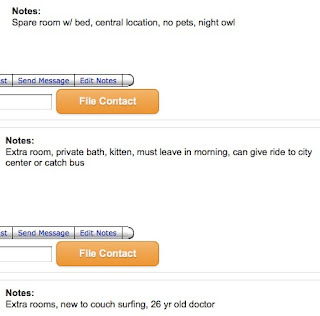 With options like these, I hardly think we'll need to look into hostels! 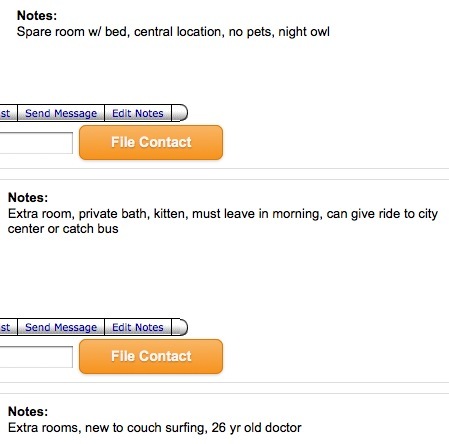 Conveniently, CS allows users to make private notes about potential hosts they find on a couchsearch & organize them in a contacts list for future reference. I haven't contacted anyone yet, but I've made a few notes about 10 potential hosts in the Aukland area. That's right. Having a kitten is note-worthy in my book. In a couple months, I could be writing about our great experience with one of these people! And that, my friends, is the joy of CouchSurfing.